Pontop Pike transmitter was opened in 1953 (though the date on the buildings at its base is 1955 ! ) to transmit BBC television on the "old" VHF 405 line system. Transmission of this signal finally ceased in 1985, though since 1966 Pontop had been broadcasting (in colour) on the UHF 625 line system. The mast is a cable stayed spaceframe with height (to the base of the transmitting arrays` shroud) of 134m, so the tip of the mast is probably another 20 or so metres above that, also see How High is High ? Base buildings at Pontop Pike. The date on the crest is 1955 though TV transmissions actually started, initially form a low power temporary transmitter 1953. Pontop Pike TV Transmitter, from the SW.
Pontop Pike viewed from Burnhope TV transmitter. Pontop Pike television transmitter from an outer stay anchor. 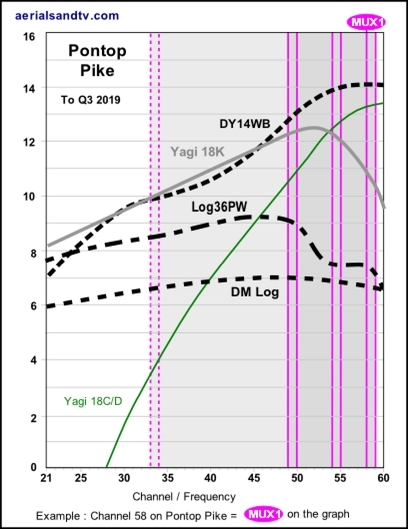 See Pontop Pike`s height in relation to other transmitters. * I know what you`re thinking, he`s a fine one to talk about “grammatically incorrect lower case” with his aerialsandtv.com, .......but that`s a URL ! 700MHz clearance due at Pontop in Q4 2019 when it is due to become a K group on CHs 32 to 45 (excl MUXES 7 & 8). The transmitter puts out up to 100kW of digital power which makes it the 13th most powerful transmitter. Note the huge increase in power after the 2012 digital switchover. Pontop Pike is horizontally polarised and it`s an E group, though it`s due it become a K group in 2019 (see Pontop`s graphs). 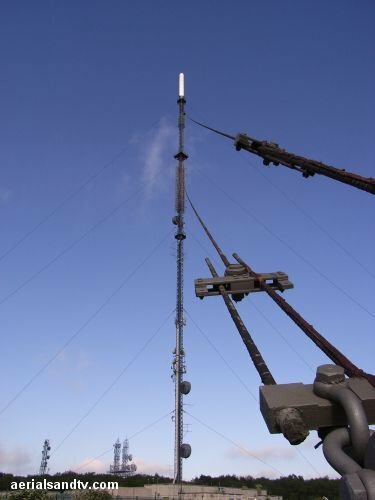 Pontop Pike has twenty five smaller repeaters to improve its coverage in poor signal areas. Burnhope transmitter was opened in 1959 to broadcast the "new" ITV channel on the VHF system which it continued to do until 1985. The fact that Burnhope is only 4m SE of Pontop is no accident because it was intended to be effectively "co-sited" and therefore it would be picked up by those with their antennas aligned on the BBC transmitter. This trick was used again when C5 came out in 1997 and Burnhope transmitted (only) analogue Channel Five up to September 2012. Incidentally this same double transmitter scenario was originally also used at Crystal Palace / Croydon, Sutton Coldfield / Lichfield and Holme Moss / Emley Moor. The first two pairs also used the former ITV transmitters to broadcast C5. 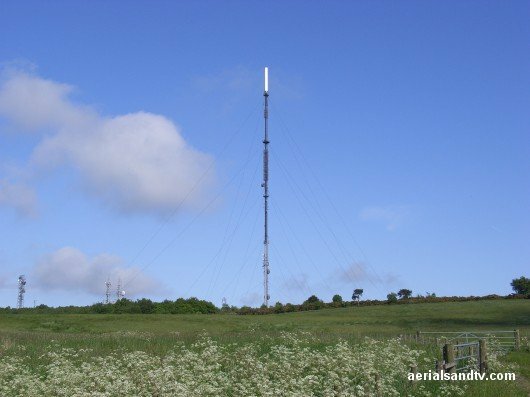 Burnhope is located about 6m WNW of Durham (at NZ 184 474) and just like Pontop Pike it is a cable stayed spaceframe with five stay levels, though the mast height is 229m, which is somewhat taller than the BBC structure. Burnhope ceased TV transmission when the analogue signal was turned off in 2012 though it is still used for radio. At one time there were numerous railway lines around Pontop Pike but now if you want to visit this area it`s a car or a bus.The ex Stanhope & Tyne Railway used to run about half a mile away and this was one of the first built in this country in 1834. It was the last to survive in the area but when the steel works at Consett shut in 1980 the line soon followed, closing in 1985. Beamish the extensive heritage site/museum is only about four miles away, it opened in 1971 and has been expanding ever since. It`s well worth a visit but there`s so much to see that I`d plan to stay all day if I were you. It`s actually good value if one considers that everything is "free" once you get in, the opposite of, say, "Center Parcs" (SPX) for instance, where everything is bleedin` extra, the Ryan Air of the leisure world. 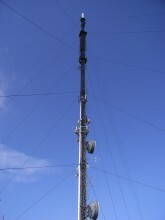 The transmitter is situated 10 miles SW of Newcastle and its population coverage is approaching two million. The transmissions are received in most areas of the North East including Newcastle, Sunderland, Durham, Hartlepool, Darlington, Stockton and Middlesborough. Bilsdale would probably be the main choice for the last three, but in the end transmitter choice is all down to "line of sight"...... 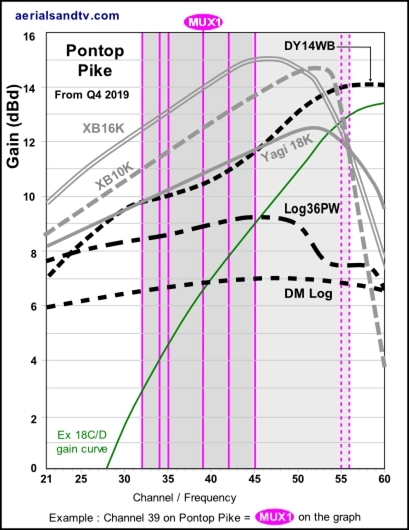 According to Ofcom Pontop Pike is nominally omni directional for all the Digital MUXES. There is one “Local” MUX allocated to Pontop Pike on CH56 (this is within the C/D group) for a Newcastle local TV station. The guide below also includes the same information for some of the other transmitters in Pontop`s coverage area, namely Bilsdale, Emley Moor, Chatton, Fenham, Newton, Haltwhistle, Alston, Shotleyfield and Weardale. The Channel Allocation Guides can be very useful in the diagnosis of co-channel interference problems and can also be invaluable if you are trying to find a spare channel for a modulated output (e.g. for a Sky box or CCTV system) to be added to your TV setup/distribution system without suffering from co-channel. medium signal areas, the Yagi 18K for poorer signal area and the DY14WB for those with the most marginal signals. 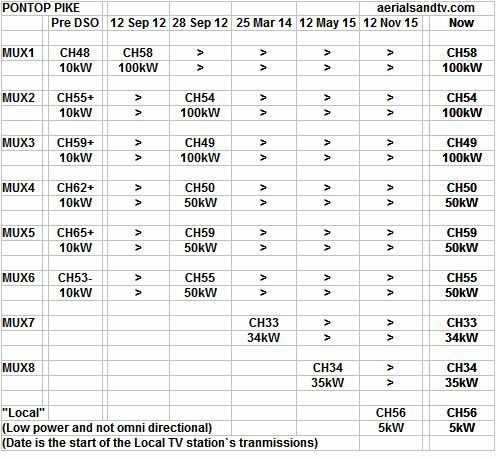 The dimensions and test performance of the aerials can be found on the relevant tables.